The speech was written by Paul Goble for the internation conference Utopia unachieved despite millions victimised? Communist crimes and European memory in Tallinn, Estonia, on 23 August 2018. Some anniversaries are marked because they are so important historically that one cannot understand the present without returning to them. Others are commemorated because they contain lessons that remain important for today. Marking the anniversary of the Molotov-Ribbentrop Pact of August 23, 1939, is about both. The world would not be in the shape in which it is were it not for that horrific deal by two dictators 79 years ago: Without that now long-ago accord, there would not have been the war in Europe at least in the shape that it took, the Baltic countries would not have been occupied for so long, and the Soviet Union wouldn’t have lasted and then fallen apart as it did. The first lesson is that open covenants must be openly arrived it. The pernicious quality of Molotov-Ribbentrop was its secret protocols that divided Europe between Hitler and Stalin. In fact, Germany and the USSR already had a friendship accord and the formal part of Molotov-Ribbentrop did nothing to add to its provisions. It was the secret protocols that are the center of what the two dictators did, and they agreed to those precisely because they were secret, the basis for action but not for discussion. The second lesson of Molotov-Ribbentrop is one that has long been enshrined in Baltic thinking: nothing about us without us. Estonians, Latvians and Lithuanians insisted in their drive to the recovery of their independence that no deals should be made about them without their participation. Molotov-Ribbentrop would have been impossible if the countries most affected by it had been present during the talks. But they weren’t: they were cast as pawns and victims rather than participants. And the consequences were disastrous. Unfortunately, again, there are many in the world today who think that the proper way to get agreement about difficult cases is for the big powers to meet and make decisions about others without the participation of the latter be it about Ukraine, Syria or anywhere else. It is of course the case that the great powers have a responsibility to take decisions but they have an equal responsibility to ensure that they do not try to do so over the heads of those about whom they are making such decisions. That is something Vladimir Putin wants everyone to forget, and tragically, there are all too many ambitious or fearful leaders in the West who are willing to go along. The third lesson of Molotov-Ribbentrop is that no border changes are permissible without the agreement of all parties concerned. Hitler and Stalin assumed that they could change borders with impunity. 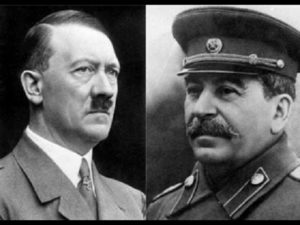 History at great cost showed them to be wrong: Hitler lost his war, and Stalin’s heirs lost much of their empire and will in time lose the rest as well. The age of empires is over. But unfortunately, the age of imperialism and the imperial temptation is not. In the last decade, we have seen Moscow change the borders in Georgia and change the borders in Ukraine unilaterally and by military force alone. Many people are now saying that the West simply has to accept this because Moscow will never back down. But again Molotov-Ribbentrop contains a lesson: It sparked American non-recognition policy, a policy that remained in place for 50 years, giving hope to the citizens of the three occupied Baltic countries and ultimately helping them recover their independence de facto and establish a post-occupation future de jure. US non-recognition policy, which had its roots in the Stimson Doctrine of 1930, remains the right way to go even if it isn’t going to lead to quick results. As Loy Henderson pointed out in his classic memorandum, the US can’t recognize aggression by anyone regardless of their status with regard to Washington on any other issues. The fourth lesson of Molotov-Ribbentrop is that in the world today, citizenship, not ethnicity, is the paramount value. Underlying the policies of both Hitler and Stalin was a view that nationality, German or Russian, was more important than the citizenship of others. That led to the 1939 accord and that led to war. In many ways, the founding principle of the United Nations was that citizenship always takes precedence over ethnicity: otherwise, the world will remain in conflict forever. And the fifth lesson of the 1939 pact is that might does not make right. For most of human history, those who had the power made the rules and ignored the rules when it suited them. But beginning in 1648 and in fits and starts since then, the world has moved toward one based on rules and laws. Molotov-Ribbentrop was an effort to turn back the clock, to go back to a world where the strong imposed their will on the less strong. Ultimately, that sparked a revulsion which led to the destruction of the systems of the two leaders who signed that agreement. But today, there are many who say that in an increasingly chaotic world, realism requires deferring to the strong rather than following the rules. That attitude affects not only dictators like Putin but authoritarians like Donald Trump. They too want to turn back the clock, to go back to a world in which their countries did what they wanted because they could not be cause they had any right to do so. Consequently, I want to congratulate those who convened this conference – I am very sorry that a funeral prevents me from attending – not only because it is important to remember the history of Molotov-Ribbentrop but because it is even more important to remember its lessons, lessons that have never been more important than they are now.